Microsoft has allegedly been making deals with Machinima partners to pay them extra if they promoted the Xbox One in their videos, Ars Technica reports. In order to qualify for the payment partners also had to keep the agreement confidential. 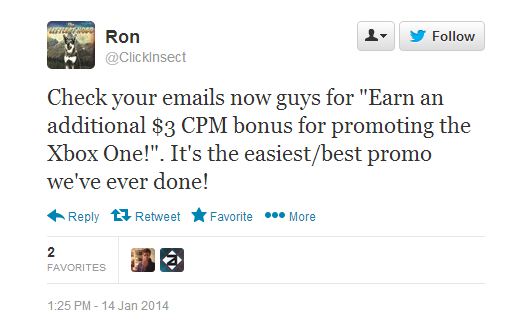 The promotion was first advertised in a now-deleted Twitter post by Machinima’s U.K. Community manager saying that Machinima video partners could earn an additional $3 CPM ($3 per thousand video views) for posting videos promoting the Xbox One. To qualify for this campaign, Machinima Partners had to post a video that included at least 30 seconds of Xbox One game footage within the first two minutes, and verbally mention they were playing the game on an Xbox One console. The videos also had to have the tag “XB1M13” and be posted between 3:00 a.m. ET on January 13th and 2:59 a.m. ET on February 10th. The promotion was set to end after a total of 1.25 million views was reached across all XB1M13-tagged videos. According to a private listing in Machinima’s activity feed on Poptent, the campaign began on January 14th and ended January 16th, which suggests that the 1.25 million view goal has already been reached. The full legal agreement states that video creators “may not say anything negative or disparaging about Machinima, Xbox One, or any of its Games” and they must also keep the details of the agreement confidential.